Tonight I attended an opening of a show by artist Seth Haverkamp. It was jam-packed with attendees and fans of Seth’s luscious works. The show was a mix between still lifes, some delightful figure studies, portraits and large works which showcased Seth’s talent painting the figure. 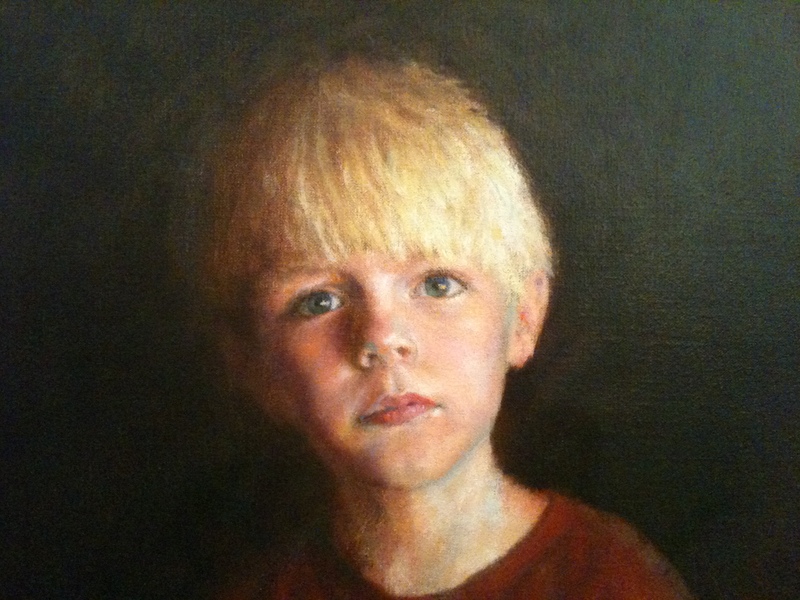 One of the pictures that drew me in was a large portrait of a blond child in a dark background. It’s titled Faust and it’s beautiful, quiet and still. I had the feeling it captured the child in a rare moment of standing still or that Faust had asked a very serious question and was awaiting the viewers response. There were several beautiful paintings of women there. 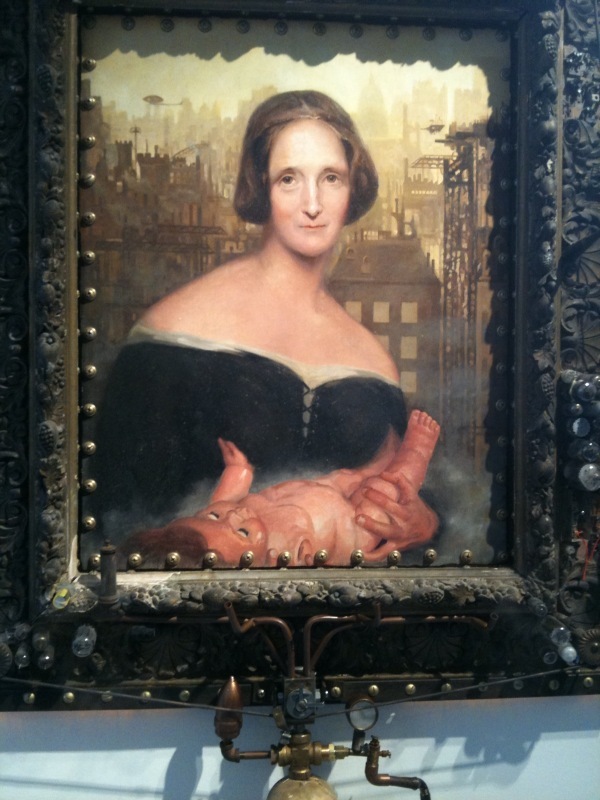 The host, Kathy, had commissioned Seth to paint her daughter’s portrait and it held pride of the place. It had all the coltish elegance and insouciance of a young lady who has is just crossed the line into adulthood. Seth had several other larger paintings of women, two really caught my eye. This is a detail of one, I don’t know the title of the painting but this is so luminous I had to post it. 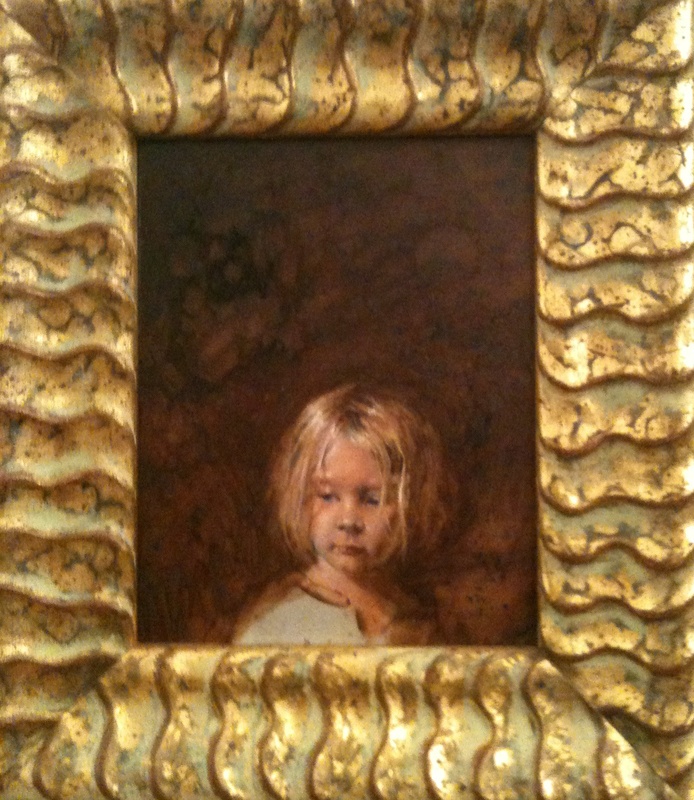 Another painting that stopped me and a friend in our tracks was this delicate one of the artist’s daughter, Essie. I don’t know what Essie is looking at and there is something so sweet about the pose that I really want to know what she saw. The background on this is a rich deep umber that seems layered and hazy but serves as a perfect counterpoint to this sweet moment that Seth masterfully captured. I’d like to thank our host, Kathy for a wonderful evening of art and good cheer but especially for providing such a lovely setting to view Seth’s newest works. New beginnings are frail delicate things that must be nurtured in order to fulfill their promise. Anyone who has ever started a campfire in a storm can bear witness to this. In this economic climate many folks would quail at the thought of starting a new enterprise. 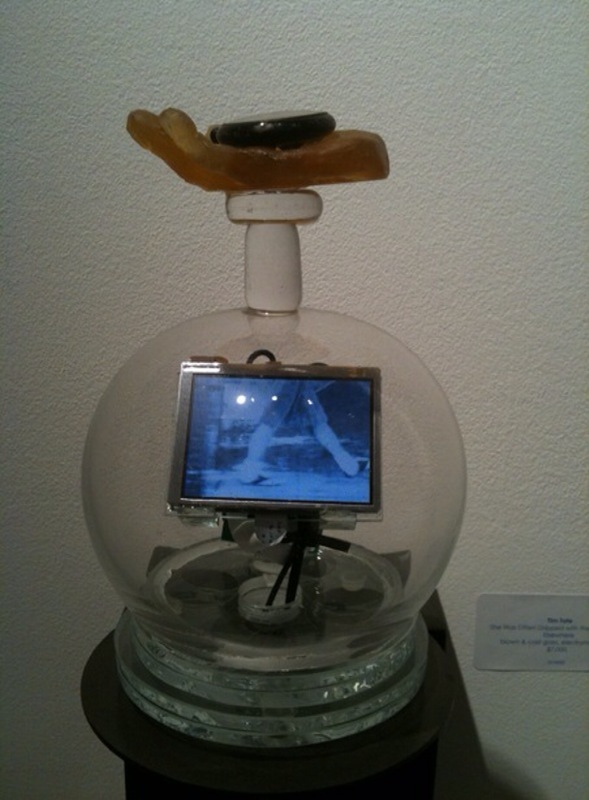 Amy Morton of Morton Fine Arts (MFA) is made of sterner stuff. Amy Morton recently left the Principle Gallery in Alexandria Virgina and struck out on her own and opened Morton Fine Arts. For her opening show titled, “ I Dream Awake“, Amy took us on a romp though a dreamland populated with amazing and glorious works. The caliber and range of artists in this show left me well, gobsmacked. 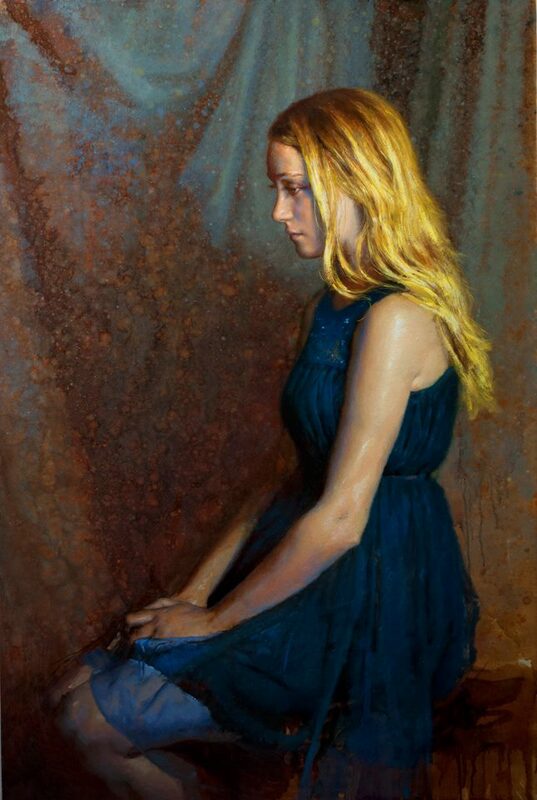 Artist Margret Bowland who won the People’s Choice Award at the Outwin Boochever Portrait Competition 2009 at the Smithsonian’s National Portrait Gallery had two amazing works of one of her favorite models displayed. My favorite of the two was titled, Another Thorny Crown. The model is a young girl from North Carolina who stares sadly and proudly at those who dare to observer her. Looking at her, you get the sense that the model is a very old soul. The painting was charcoal and pastel on paper unframed and unshielded from casual touch or the a breath or well anything. I loved it! I was also introduced to several new artists at the show, Vonn Sumner and Mikel Glass. 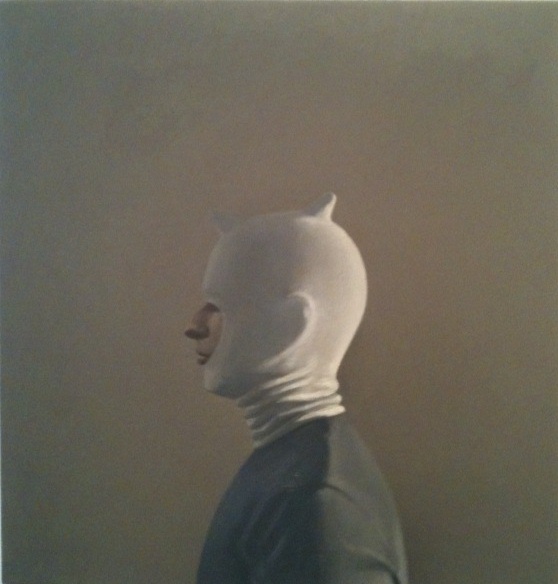 Vonn Sumner paints these wonderful sharp subtle paintings of figures. They are male, they are in these outlandish masks, and when you peer closely you realize-well, they are Vonn. I loved them! At first glance they were flat and very much a 2D image. But the image was so compelling I had to look closer. And having looked at one, I was hooked and had to closely examine every one of them. 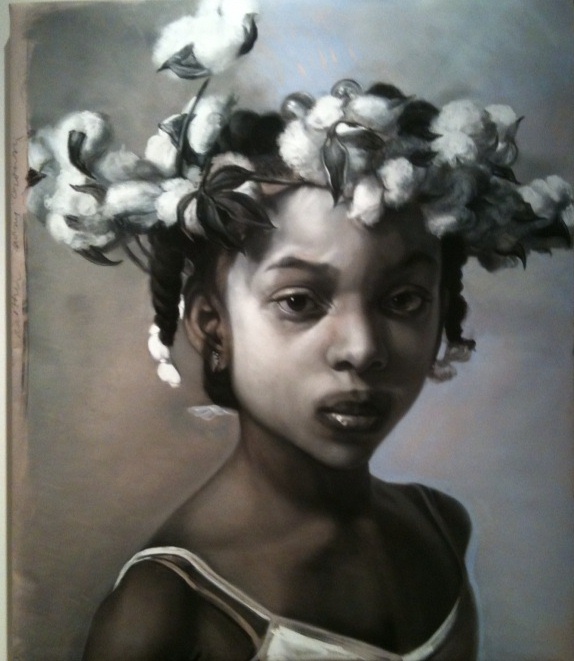 If artist Vonn Sumner’s works are sharp and subtle, artist Mikel Glass’s works were a study in contrast. His painting, Machine in the Garden- Steampunk Shelley had a woman clasping a child very Edwardian and upright, in this incredible frame. The frame had parts that moved, wheels gently turning a thin belt around the painting, vacuum tubes sprouted out of the frame in groups like silver space age mushrooms. And then there was this stand. The stand looked like it was brass and part of an antique floor lamp. If you pushed down on the top of the stand and waited, a thin fog would waft up out of the frame to add to the experience of viewing his painting. I normally would not enjoy this type of thing because it detracts so much for the work, but it was all the work…and, well it was fun. I made the fog several times and belly laughed each time I did it. Thank you so much Mikel! I was happy to also see one of my favorite DC artists, Tim Tate at the show. Tim had three beautiful works on display. The one that caught my eye the most was his, She was Often Gripped With the Desire to be Elsewhere. The video clip seemed to be of a young child’s legs filmed as casually strolled along. I kept staring at the image because it reminded me of something but I couldn’t think of what it was. Then it hit me, for some reason the walk reminded me of Scout (Atticus Finch’s daughter) from the movie to Kill a Mockingbird. I love just about everything Tim has made, and I am still mad at myself for not buying one of his glass hearts when I could (grrrr always will be the one that got away for me!). Amy Morton guided us through an amazing wonderland with MFA’s inaugural event, I Dream Awake. If this carefully curated show is a hint of things to come, I can tell you two things. Most importantly Amy did well to follow her vision which lead to her to creating MFA and number two, she’s hit it out of the ballpark on this one. Congratulations Amy! Note- there are some phenomenal pictures of the show and some of the works at Brightestyoungthings.com. One of the models who works for the Alexandria Art League was involved in a serious accident several weeks ago. She is slowly recovering but had no health insurance and has had two surgeries so far. The wonderful folks at the Alexandria Art League have decided to host a fund raiser to help defray her medical expenses. Artist Robert Liberace will conduct three painting demonstrations on Monday 6 July 2009 at the Duke Street Annex in Alexandria Virginia. If you attend during the day there is a free trolley that shuttles between Union Street at the waterfront and the King Street Metro Station (blue and yellow metro lines) -it runs every 20 minutes. Once at Union and King Street the Duke Street Annex is 2 blocks south. Rob will be painting all day and should stop around 9:45pm. If you’ve never had a chance to see him in action-whether you paint or not-now is the time. I am pretty excited because usually during classes, I am torn between watching Rob’s demo and/or painting. Throughout the day there will be a silent auction where you can bid on works by Robert Liberace. Rob has been holding on to his class demos (which are wonderful!) and will have those for sale as well as the demos he creates during the fundraiser. All of the proceeds go directly to help Ada. 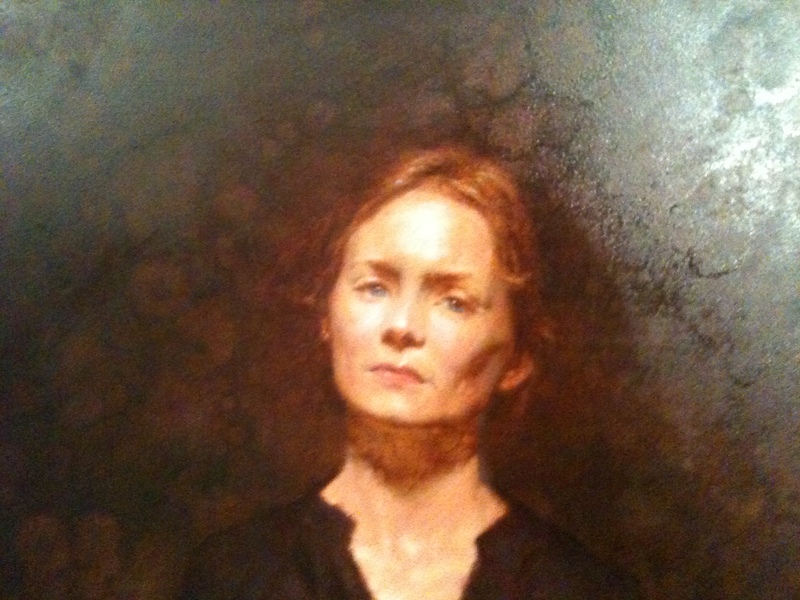 So, if you’ve been fortunate enough to paint with Ada as your model, if you attended the paint-off at the Portrait Society of America (she was a model), if you’ve always wanted to see Robert paint and learn about his techniques-and best of all-if you want a chance to help someone in serious need—plan on attending! I will see you there. PS if you can not attend and would like to donate, contact the art league at 703.683.2323. On Thursday evening (25 April 2009) 15 portrait artists participated in a face off with five models in the grand ball room of the Reston Hyatt in Reston Virginia. The following nationally known and reknown artists participated: Laurel Boeck, Judith Carducci, Vasudeo Kamath, Ann Manry Kenyon, Ying-He Liu, Thomas Nash, Rich Nelson, Dawn Whitelaw Paul Newton, Anthony Ryder, Chris Saper, Jason Bouldin, Scott Burdick, Wende Caporale and of course Robert Liberace (yes I am biased!). The difficulty for the artist participating was to produce a fairly complete portrait or at least as much of the portrait as they could while subject to the scrutiny of hundreds were watching, photographing, and commenting as well as asking questions. Participating in this is certainly not for the faint of heart! The organizers set the room up so that there were three artist per each model. This worked out fantastically since it allowed each artist to have a fair shot at a workable angle of a model and reduced crowding between artists as well as the artists and the crowds. Due to space limitations I’d like to focus on the model Desi. Anthony Ryder was set up to the model’s right, Judy Carducci was directly in front of Desi and Robert Liberace was to the model’s left. I thought I’d taken a picture of Judi Carduci but sadly I can’t find the one of her in action. These are the final results from Ryder, Carduci and Liberace. Judi Carducci won the event (the conference attendees voted on this). Now the best part of this was that the winner was allowed to select their model and Judi selected Robert Liberace as her model. So on Friday morning Ms. Carducci gave a wonderful demo on painting a pastel portrait. Due to posting length I will make a second posting with pictures of the other artists working during the event. I am most inspired by realistic painters, so if you are like me in this respect you might want to skip this posting. Or, you might just want to read on and try on something new. Matt Sesow is a Washington DC based artist. Matt’s work slaps you in the face and wakes you up like a venti cafe americano with 2 extra shots of espresso. Or at least that’s how his work affects me. I’ve been a fan of Matt’s work since I ran across it at at last year’s DC Artomatic. I bought a small painting titled Hillary and two tiny works, one titled Puking and I am uncertain what the title of the other painting is but it featured a little girl in a screaming red dress. His work is not demure, quiet, realistic, representational or subtle in coloration. All the things that normally attract me to an artist’s work. I do not understand why his work appeals to me. But at some deep gut level I respond to it, I don’t understand why, it just does. 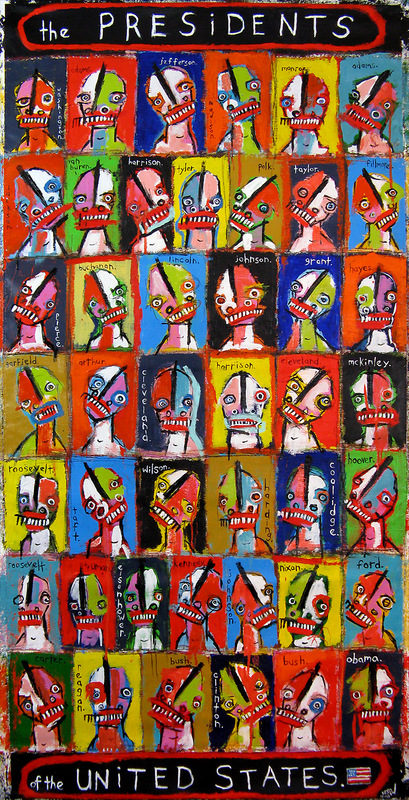 Some of his work reminds me a bit of Bacon and some (primarily his color usage and sheer exuberance with paint) reminds me very slightly of Basquait. Very very slightly. Although referred to as an ‘outsider artist’ I don’t consider him one for several reasons. The phrase initially referred to folks who were institutionalized (i.e., inmates of prisons or insane asylums) and later was used to denote the artist was self taught and the work was naive -something along the lines of Grandma Moses perhaps. Frankly, I do understand the current use of the word but it’s still hard to shake the more pejorative meanings associated with it’s earlier usage. Matt is fully plugged into the DC art scene as well as other venues and shows throughout the states; his bio is quite impressive. His work has hung at Andrea Pollan’s Curator’s Office during her Mixology I show which benefited Doctors without Borders, as well as shows at the Longview Gallery in downtown Washington DC. He’s also had shows in Denver, the Hamptons, Maine, Atlanta, and San Diego CA; he maybe self-taught, but this ain’t your mother’s outsider artist. Matt Sesow’s painting Presidents is not mine. Yes that made me a very sad Panda, I wanted it but was too slow off the mark to buy it. I think it’s phenomenal. He painted all 44 Presidents with their names and his take on them is pure genius. Last week I met Matt in person when I stopped by his studio with a friend to look at a painting I’d seen online. I didn’t buy that one, but I walked away with quite a few others that I absolutely loved! The larger painting is an 18×18 canvas which features columns of sketched white bunnies, its aptly titled, Lost in a Crowd. For some reason one of the bunnies is circled with cadmium light red which seems to isolate the bunny even further. Matt’s smaller works don’t necessarily photograph well, these photographs are from his website (used with permission). You lose a lot of the punch of color and brushstrokes compared to when you see them in person. I will try to take some better shots but I am afraid that the glossy black of the background will go matte and that you simply won’t get the effect of the paintings. Matt Sesow was a wonderful and pleasant host as my friend and I ransacked his studio looking at his paintings. However, be warned: Matt’s work is difficult to see in person, its compelling, raw and emotional these are not “pretty pictures” you will walk away affected by what you’ve seen. Matt had a very traumatic experience when he was 8 and there are times when you can clearly see the effect this had on him and his work. He was struck by an airplane propeller and he lost his arm as a result. There were several works that I would look at, then look away from and then look at again. In each case I wasn’t certain if he was referencing the events of the accident, or if he was simply playing with an image. It was difficult to tell and I hesitated to ask. I found the painting Preacher to be extremely powerful. The whites in some parts are translucent and the orange and red scream at you to look. Despite it’s name, this painting reminded me of how I felt one time when it seemed like my world was caving in. So for me the question was does this painting attract me because it shows how the inside of a dark troubled soul is, or does the image invite me in to participate and supply my own dialogue and story line? In the past I would have scoffed to read that last line, but again-Matt’s work requires that you bring something to the table when viewing it. You look at it, you like or even dislike it, then you have to ask yourself why. Why do I like, love or dislike it? Not matter the reaction, viewing his work will provoke you to a reaction. Now I need to say one other thing, I am not a huge fan of modern art, especially not the likes of Basquait or Kadinsky or a host of others. I used to always joke that the phrase “contemporary art” is actually french for “I can’t draw”. I guess I simply don’t understand it although I am trying. I don’t classify Matt’s work in this vein even though it’s edgy and modern and so very open to interpretation. There is something so compelling and powerful about Matt’s work that I am drawn in in spite of my misgivings about the genre in general. Go and view his works, if you’re in DC I recommend you contact him and set up a time to view the works in person since they are best viewed in person! Contact information and directions to his studio can be found here.